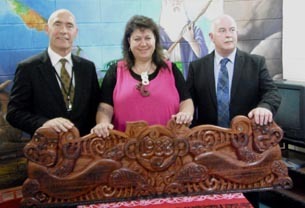 Two carvings and a painting, commissioned by the North Shore Hospice, were handed over in a ceremony at Auckland Prison's west chapel last month. They will be installed and unveiled in a public ceremony at the hospice in October. The carvings and painting were produced by a well-established carving group at Auckland Prison. Tina Parata, Kaiawhina at the North Shore Hospice, says the work includes a pou (carved pole), a pare (lintel) and a painting. Together, the works tell the hospice’s story and illustrates the four aspects of Māori health: Taha Wairua (spiritual wellbeing), Taha Hinengaro (mental wellbeing), Taha Tinana (physical wellbeing) and Taha Whanau (social wellbeing). Twenty members of the community attended the handover, including kaumatua from Ngati Whatua and master monolith carver Kerry Strongman, who donated the rakau (wood) for the project. Mark Lynds, Manager, Contracts and Services, Department of Corrections, says guests at the handover to the hospice were stunned by the craftsmanship and humbled by the Mihi Whakatau ceremony that accompanied the handover. Mark and Terry Buffery, Acting Regional Manager Northern Prison Services, both spoke of the importance of breaking down the barriers between prisons and the community through projects such as this. For Tina, the project is a win-win situation for everyone: the hospice, the Department of Corrections, the local community, the prisoners and their families. The pou will be installed in the garden in front of the hospice; the pare will be placed over the entranceway; and the painting will hang inside in the reception area. “It’s hard to put into words how incredible these artworks are and how much help they will be to me and to Māori coming into the hospice,” Tina says. “The hospice is a European concept and traditionally, it’s not a place that Māori would consider going to. These works will be welcoming to Māori coming through the front doors – whether they are visitors, patients or staff. Tina was one of the hospice community members who met with Mark Lynds and the prisoners to talk about the hospice and the commissioned project. The prisoners then developed a brief about what they would like to do. Tina says that when the hospice’s Māori Advisory Group (including Ngati Whatua Kaumatua) saw the brief, they loved it and adopted it immediately. Original generation time 1.6210 seconds.